The LG 42LK450 is a forty two inch 1080p LCD television that offers Intelligent Sensor systems to automatically adjust your settings according to the ambient lighting levels in the room, Picture Wizard II to give you a bit more control over making those very same adjustments, SIMPLINK connectivity that lets you control all your HDMI-enabled devices via the television’s remote, two ten watt speakers, two component video inputs, one USB ports and three HDMI inputs. 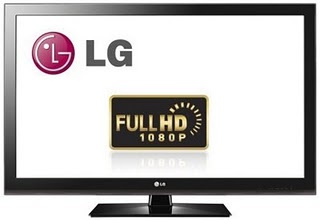 LG 1080p (Full HD) provides 1920 x 1080p picture resolution delivering incredible picture clarity and vibrant colours. You'll see up to 5 times the picture clarity and detail in comparison to standard definition and double the detail compared to HD Ready 720p. 1080p television is the only way to fully experience the true potential of high definition gaming and blu-ray which takes you even closer to the action. Connect your games console, blu-ray player or home cinema system through the 3 H-D-M-I ports for a true High Definition multimedia experience. LG 42LK450 is not the best 42" LCD TV out there but at the price of around 500$ it is definitely one of the cheapest.